Feral dogs are often found in forested areas or shrublands in the vicinity of human habitation. Some people will not tolerate feral dogs in close proximity to human activity; thus they take considerable effort to eliminate feral dogs in such areas. Feral dogs may be found on lands where human access is limited, such as military reservations and large airports. They may also live in remote sites where they feed on wildlife and native fruits. The only areas that do not appear to be suitable for feral dogs are places where food and escape cover are not available, or where large native carnivores, particularly wolves, are common and prey on dogs. Like coyotes, feral dogs have catholic diets and are best described as opportunistic feeders. They can be efficient predators, preying on small and large animals, including domestic livestock. Many rely on carrion, particularly road-killed animals, crippled waterfowl, green vegetation, berries and other fruits, and refuse at garbage dumps. Livestock and poultry can be victims of harassment, injury, and death from both domestic and feral dogs. Distinguishing between livestock killed by domestic or feral dogs and that killed by coyotes may be difficult since the mode of attack can be similar. Coyotes usually attack an animal at the throat; domestic dogs are relatively indiscriminate in how and where they attack. Sometimes, however, dogs kill the way coyotes do, and young and inexperienced coyotes may attack any part of the body of their prey as dogs would. The survival of feral dogs, much like that of other wild canids, depends on their ability to secure food. Therefore feral dogs are usually adept predators. Unlike most domestic dogs, feral dogs rely on their prey for food, and thus consume much of what they kill. Feral dogs favor the hindquarters and viscera (liver, spleen, heart, lungs). When domestic dogs attack domestic animals, they may injure or kill several, but they seldom consume their victims. Rather, they leave the impression that they were involved in vicious play rather than an attempt to obtain food. The most diagnostic characteristic of injuries caused by dogs is usually the slashing and biting of prey animals over much of their bodies. Wade and Bowns (1983) and Acorn and Dorrance (1990) present a detailed pictorial and descriptive aid to identifying predators that damage livestock. Feral dogs may become skilled at hunting in groups for small game such as rabbits and hares and large game including deer and even moose. Some wildlife managers feel that feral dogs are a serious threat to deer, especially in areas with heavy snows (Lowry 1978). Others have found no evidence that feral dogs pose a significant threat to deer (Causey and Cude 1980). Clearly, the impact of feral dogs, both on livestock and wildlife, varies by location and is influenced by factors such as availability of other food, the number of dogs, and competition by other predators. Feral dogs may feed on fruit crops including melons, berries, and grapes, and native fruits such as persimmons and blackberries. Damage to melons is similar to that caused by coyotes. The side of a ripe melon is usually bitten open and the insides eaten. Feral dogs commonly kill house cats, and they may injure or kill domestic dogs. In areas where people have not hunted and trapped feral dogs, the dogs may not have developed fear of humans, and in those instances such dogs may attack people, especially children. This can be a serious problem in areas where feral dogs feed at and live around garbage dumps near human dwellings. Such situations occur most frequently around small remote towns. On the Galapagos Islands, feral dogs have significantly impacted native populations of tortoises, iguanas, and birds. 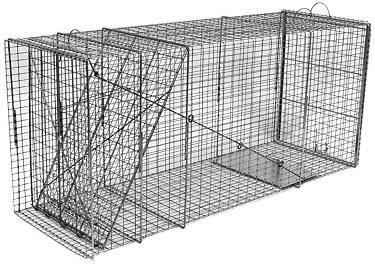 Live traps are generally effective in capturing feral dog pups and occasionally adult dogs. Steel leghold traps (No. 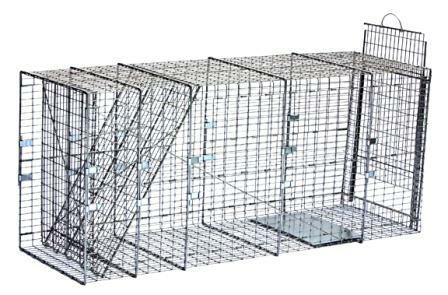 3 or 4) are convenient and effective for trapping wild dogs. Carrion and scent baits used to lure coyotes to traps may be effective in attracting feral dogs. Nontarget species or pets inadvertently captured can be released. 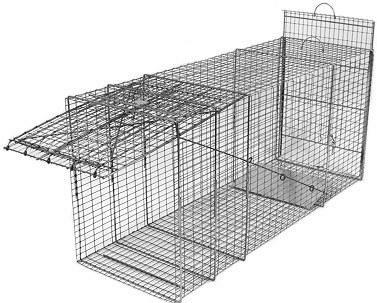 Caution should be exercised when approaching a dog in a trap, since feral dogs may be vicious when confined, and even pet dogs may bite under those circumstances. Cable neck snares may be set at openings in fences or along narrow trails used by dogs. Use care when setting snares because they may kill pets or livestock that are caught.